I can go on and on about dal. When I’m in doubt about what to cook and eat, it is dal and rice, or dal and roti that come to my mind. A bowl of dal and hot steaming rice cooked to perfection is the ultimate comfort food for me. A meal of dal and rice also brings back childhood memories of my mother mixing hot rice with plain yellow dal (toovar or arhar dal) topped with a dollop of pure ghee and a dash of lime with a sprinkling of salt for my sister and me. Simple but pure satisfaction with the touch of mother’s love. A meal of dal and rice, with a fenugreek leaves salad is also my personal favourite from my mother-in-law’s kitchen. Dals can lend themselves to a variety of preparations in the form of soups, savouries, sweets, salads, crisp pancakes (the Indian dosa being popular worldwide), right from breakfast dishes, main courses, entrees, sides, dips, etc giving the creative cook an array of dishes to choose from, apart from providing immense nutrition. With its protein (an excellent source of protein for the vegetarian), iron and vitamin B rich components, it is an intrinsic part of every Indian meal, prepared in some form or the other and making an appearance on the table of almost every Indian home in the 28 states and 7 union territories. There is no denying the fact that Indians love their dal! Here is an article I wrote for the Bombay Times about the much loved and revered dal. P.S: The dals pictured above went into making a delicious dal for lunch today. So right about Dal. Cannot imagine a day without dal in my family! MErry Christmas to you & A great year ahead! Anu, you might scorn at this classic combination , but my favourite combination (since I was three years old) has been hot dal rice and cold thick curds. Nothing better. 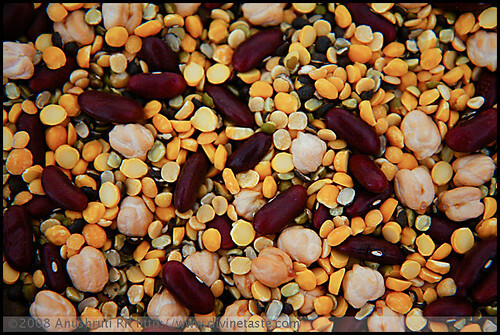 Rustoo: Yes…it was a mixed dal. I love toovar dal the best. I also relish dal makhani, though i have never tried making it. May be i should take your help with the recipe..
hey pankaja told me about this site and i am glad that she did! wow along with the yummy dishes i am also a fan of your style of writing! really touching once one start reading cannot leave till the end! Jyoti: Thanks. I'm happy you enjoy this site.